Sinead Moriarty is one of my favourite Irish writers and the book that sold me on her writing, which I read a while ago, was The Baby Trail. In this book we met the character Emma Hamilton who was desperately trying to become pregnant without any luck. It was a book that was equally funny and moving, and I just loved reading it. 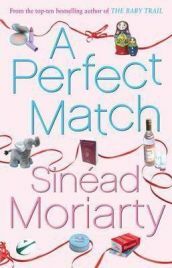 Therefore I was delighted to discover that Sinead Moriarty had written two more books about Emma and her husband James. The next book was A Perfect Match, which I am reviewing here, and this one follows the couple on their quest to adopt a child. At the start of A Perfect Match, Emma and James are just about to embark on the adoption process. Emma, naively, expects it all to be quite straight forward, but is soon dismayed that there are many hoops to jump through before they can even be approved for adoption. They have to meet with social workers, attend courses, be scrutinised under home visits and be forced to do much soul searching and to lay their souls bare before what feels like the entire world. It is definitely not an easy route to follow, and it is understandable that at times Emma wonders whether it is worth it and whether she would be better off attempting more IVF (that was so unsuccessful in The Baby Trail). Even after all this, if they are approved, they still have to be matched with a child in Russia which is the country they have opted for. I won’t tell you whether they are successful or not, but it is quite an emotional journey and one with a few unexpected twists as well! There are some lighter story lines threaded in along the way too such as Emma’s dysfunctional family’s antics and her friend Lucy’s impending marriage to rugby player Donal. Also, as James is coach to the Leinster rugby team, we also follow their progress in a very important cup challenge. All of these present the perfect antidote to the more serious matter of the adoption. A Perfect Match is a very easy book to read mainly, I think, because it is written in the first person, and told by Emma. It is a very chatty style and you really do feel that you get inside her head as she is telling her story. She is a very likeable character, although I did feel that in the early parts of the book, there was a danger of her coming across as a bit flippant and not taking the adoption seriously. By the end of the book though, you really do feel for her and want her and James to succeed. James is a great character too and out of the pair of them he is the one with his head firmly fixed to his shoulders. He often has to try and bring Emma back down to earth when she seems to get carried away and wants everything to have happened yesterday. I really liked all of the other characters in the book too. All were well rounded and developed and were characters you could believe in. Although this is an easy book to read, I don’t think that it takes the business of adoption lightly. Having friends who have adopted, the process described did sound very familiar, and the emotions that were displayed were very real. However, there are obviously much more factual books that make more informative reading! I found the storyline absorbing from the very start and did enjoy the way that the book followed on from The Baby Trail. Having said that though, I do think that A Perfect Match could easily be read as a ‘stand alone’ book, although I would probably recommend reading The Baby Trail first. Also, there is a third book – From Here to Maternity – which comes after this book and it is in my ‘to read’ pile. Having enjoyed A Perfect Match so much, it is likely to reach the top quite quickly! No Comments on "A Perfect Match"